Bands live. And bands die. One such band that has sadly fallen into the latter category is Nottingham's Hot Horizons. Thankfully, they're putting out a posthumous release on Denizen Recordings, a label that we were pleased to discover also houses the intriguing post-grunge teen trio Kagoule. I'm not even sure post-grunge is a thing but whatever Kagoule do, they do it well. They haven't had much national attention, although being played on BBC Radio 1 this week (albeit late night) is potentially the first of many big steps. Their wondrous melodic fuzz flickers between grunge and shoegaze, especially well on 'Made Of Concrete', which appeared on last year's four track 'Son' demo EP. Indeed, 'Made Of Concrete' surprisingly isn't that far off a Hot Horizons track. Perhaps this is some sort of symbolic passing of the torch? Either way, all this Nottingham talk also reminds us - where have Late Of The Pier gone? 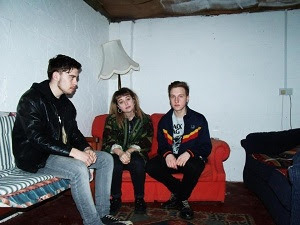 Hopefully Kagoule will prove to be equally as exciting as their Nottingham contemporaries. Find more info at facebook.com/kagouleuk.